What is an Apple Distinguished School? This designation is reserved for programs that meet criteria for innovation, leadership, and educational excellence, and demonstrate a clear vision of exemplary learning environments. JA is Mississippi’s first K3-12 school to receive the designation and is part of a small group of schools and colleges worldwide recognized as Apple Distinguished Schools. An Apple Teacher has participated in a self‐paced professional development program created to empower and support educators. Apple Teachers provide Multi-Touch Apple Teacher Starter Guides in iBooks for Mac and iPad, so they always have the tools they need to connect with their students. The program is available to all educators and is free for all schools and districts. 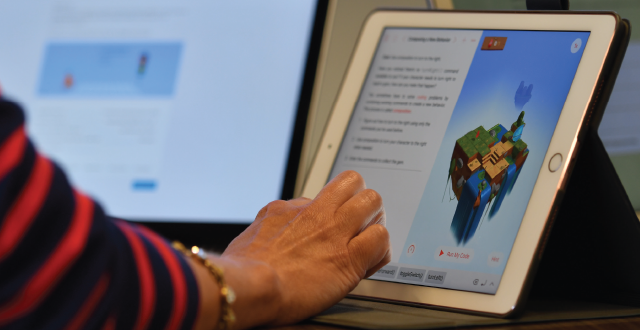 In Sandra McKay’s American and English literature classes, being an Apple Distinguished School creates a paperless space where students build skills in creativity, critical thinking, communication and collaboration. “I think the one-to-one program has made us all better teachers,” says McKay. Through this program, our teachers are supported and empowered to educate the leaders of tomorrow with the leading technology of today.